When it comes to the cloud, most businesses have moved from wait-and-see to a "how do we make it happen now?" approach. But the complexities of moving valuable content from legacy systems to the cloud is still a daunting challenge. That's why some businesses are putting off the move even though they're painfully aware of the limitations of legacy infrastructure like network shares, enterprise content management systems and general purpose file servers. The good news is the upside of migrating away from legacy infrastructure to a Cloud Content Management platform is far greater than the effort to get there. All you need is a plan. 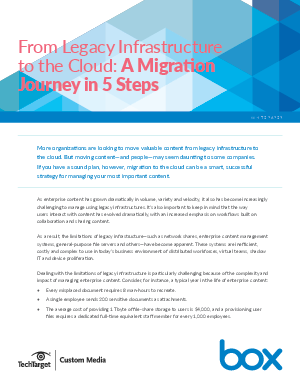 Our new eBook, From legacy infrastructure to the cloud: A migration journey in 5 steps, gives you a clear, methodical process for migrating your organization to a Cloud Content Management solution.